And how it brought God's ire. I'll tell to you tonight. Or maybe that day he was stewed. That drink is cowboy coffee. I swear the whole story is true. Or the flag of the red, white, and blue. (Just think of the one of McGee). That lived in the West country. As if they were one from the start. And a source of Western pride. And he knew how to take a stand. The outlaws, they did hide. He was known through the countryside. Have you heard of the shot, and the bear he got? I heard it from my 'pards. It was running fast, the light was past, It was more than a hun'r'd yards. And he nailed him in that part. Right at the feet of Bill. Of how he got the boar? As the beast charged with a roar. When his gun did jam, Wild Bill said "Damn!" And he knew 'twas a fight for life. And drew his Kabar knife. As they fought there cheek to jowl. And he bellowed a frightful howl. Then Bill would too give a wild "Yahoo!" For his heart was in this fight. And we had roast boar that night. In fact he was a mortal man. As writ in the Godhead's plan. His chips Bill cashed them in. And the preacher said "Amen." Or the clouds were angels are found. Was the way he brewed his coffee. With a cigarette perched on his lip. His Colt slung low on his hip. He had blood all over his pants. "Wild Bill, you've had your chance." You smoked that wretched weed. And the laws that I decreed. And set beside the fire." "If you just took it off in time. But the beans were perked 'til the coffee was jerked. You know what you did was a crime. You know what you did was wrong." And a color as black as a hole. And the result was most depraved." And Wild Bill got up his hope. Who did have more skill with rope. And the fence that needed some mendin'." To the lord of the legions of hell." And he threw them out under a tree. Then I might have some time free. Then I'll pay the devil his due. In the places I'll go, surely God wouldn't know." So did think our dead buckaroo. Then put on an all-night log. If I'm caught with a deer or a hog. I will hunt and have me a time." And the pot it grew thicker in grime. That the days they passed quickly by. And he kept huntin' 'round on the sly. These words they should be obeyed. Even Bill himself was dismayed. And the devil he sniffed a smell. His face was torn in pain. Of his ears like a old steam train. "What retch is this?" he exclaimed with a hiss. "There is something dead in here. Hell's no place for this, I fear. Get the hell out of my Abyss. That wasn't half as bad as this." For he sure couldn't stay in hell. In the land where angels dwell. I am sure that I have him along. I've told to you tonight. In words I don't just dabble. 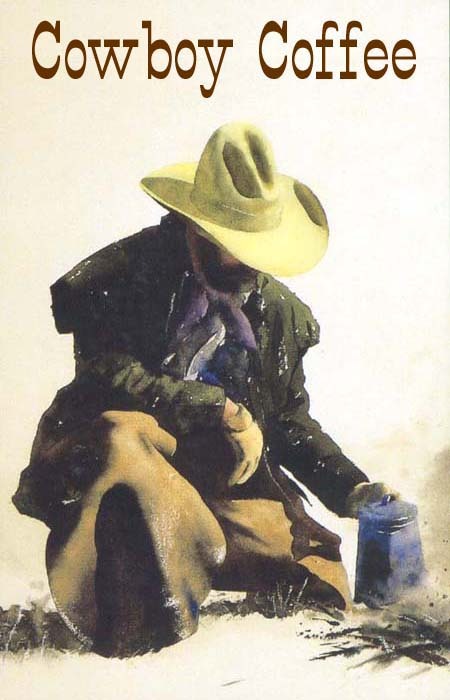 A bit of explanation: This poem is in honor of my brother Bill, who brews real Cowboy Coffee, a mean drink with all the hair on: he puts cheap grounds into a percolator, fills it up with spring water, and sets it on the edge of the campfire for five hours. He refuses to let me clean the pot, says it might affect the flavor, so the coffee is black and strong, the pot is blacker and stronger yet, but the taste is something divine! So I don't ever wash the pot. And I presume you know about The Cremation of Sam McGee, written in 1904 by Robert W. Service. See the link, above and right, to read about him.